Muted colors and layered elements create a calming oasis in a master bedroom perfect for drifting away. As a single mom of three renting her home in the suburbs of Philadelphia, interior designer Denise Sabia has to be budget conscious and strategic when it comes to creating a stylish and welcoming space. Luckily, she is also a DIY expert. As founder and owner of The Painted Home, she takes everyday items found in flea markets, in thrift shops, or by the side of the road and transforms them into gorgeously chic pieces. In her master bedroom, for example, she created this calming private oasis with a little money and a lot of elbow grease. 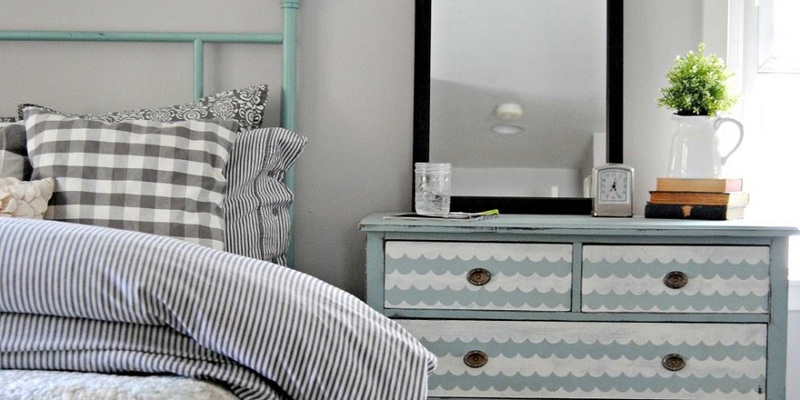 Here are a few of the design lessons we learned from Sabia’s bedroom makeover you can use to create an equally special oasis in your own home.